Thought I would share a couple of pictures I've done of spaceship cockpits. They're only 2-dimensional, and I did this mainly for fun, trying to imagine what it would be like looking out of my spaceship windows as I arrived at some unexplored planet. I don't know if there is any way to overlay our own 2D cockpits in SpaceEngine, but I would sure like to try a video with a cockpit view. No doubt SE will have 3D cockpits in the future. Real spaceships will not have windows Except maybe shuttles or special service craft. Better to think about huge panoramic display around the pilot's chair, or even virtual reality helmet. BTW, these type of "cockpit" (displays) may combined well with real multiple monitor set-up. Think about design of SpaceEngine interface for 2 or 3 monitor set-ups. What would it be like? It is possible to take into account real physical location, such as turning and size of each display, maybe adjusted in a config file or using some sort of 3D configuration wizard. I hadn't thought that far ahead really. I know you have your own ideas on what kind of display you want. This was just my feeble attempt at making one. I did this more for fun really. I can imagine your planetary shuttles will have 3D cockpits anyway, mine's just a mere 2D idea, created for a single 22" widescreen monitor at 1920x1080. The picture sizes and resolution would not be suitable for larger multi-monitor set-ups, although the wider picture of the two above can be split in two for a dual monitor set-up, but resolution-wise it may not look so good. You are doing a very good job on your cockpits for spaceengine! I can't wait until I try out the spacecraft with a cockpit in it! Please keep up the excellent work on your cockpits! Please SpaceEngineer, tell us there is a way to do that, to overlay the Normal view/Fov with custom Images, it could be really great fun until real 3D cockpits. 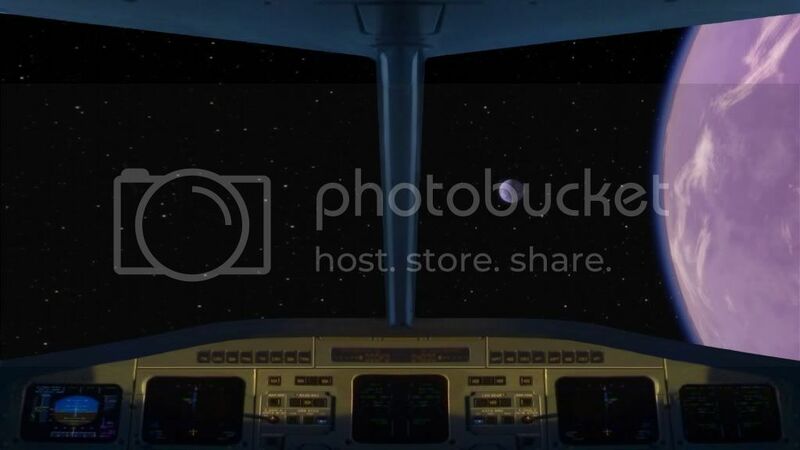 But if you draw some cockpit textures, I may add it as additional feature. I haven't the skills for that, but I really hope somebody else will do it ! The ship of the future does not need any real cockpit, it can percept the outside reality by it's own subsystems and easily operate all available information. It can even build a virtual reality completely corresponding with actual situation. However, it still needs a futuristic-looking GUI, I guess, some holographic-style floating buttons, icons and windows might be helpful. Sorry, Russian language only - AFAIK that isn't very popular outside Russia.